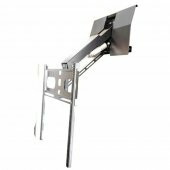 Our Ultra Wall Support Kit was designed to provide greater mounting flexibility when attaching any of our mounts to your wall. It works especially well in applications where only a single stud is available, or where non-standard stud spacing exists, for example, when the studs are spaced greater than 16 inches. For additional details, please review our Ultra Wall Support Manual. 16in apart. If the wall isn’t sturdy enough then more support will need to be added, consult an expert. from an improperly installed mount. and figure out where the TV mount should go before doing anything with the Wall Support. To find out how the mount relates to the Wall Support you should do a test fitting on the ground. Once you know your location pre-drill the 6 mounting holes 2.5in deep using the 1/4in drill bit. The first way is to mount the Wall Support to the mount and then attach everything to the wall together. The second way is to mount the Wall Support to the Wall and then attach the TV to it, when you do it this way be sure to put the 8 carriage bolts in the correct slots of the Wall Support before tightening it on the wall. To attach the Wall Support to the mount, put the 8 3/8in carriage bolts through the back of the Wall Support and through the mount as shown in Figure 2. Screw everything together with the 3/8in washer, Bolt Cover Washer, and 3/8in Locknut. Use a 9/16in box or socket wrench to tighten everything together. Maybe only tighten 2 bolts at first in case the level needs to be adjusted. Use the 6 3/8in lag bolts with 3/8inwashers and Bolt Cover Washer to attach the Wall Support and Mount to the wall. Tighten with a 9/16in box or socket wrench until the mount is firmly pressed against the wall. A friend makes this much easier. Do NOT over tighten. If you have a stud that is centered on the mount and cannot access because the main support arm of the mount is up (this situation is shown in Figure 1) the following is what you do. First bolt everything else up to the wall, you should be able to get 5 of the 6 lag screws in. Articulate the mount down so that the upper slot can be accessed. Drill and put the lag screw in while holding down the mount. need all 3 lag screws on the top though; do NOT skip a lag screw on the top. fasteners blend in with the rest of the mount.